Step aside, spinach. Move over, edamame. Kick it, kale. The protein-packed and fiber-rich nuggets have been cropping up in grocery store salad bars and delis from Whole Foods Market in Seattle to Spokane’s Main Market and Moscow Food Co-op. They also can be found in a frozen legume medley at Trader Joe’s, in appetizers and entrées at Spokane’s Downriver Grill and even in some corporate cafeterias and school lunches. And, if a small, family-owned Spokane firm has its way, consumers will be seeing a lot more of the bright green beans. Fresh Nature Foods specializes in growing and distributing green garbanzo beans, also known as chickpeas. Since forming two and a half years ago, it has been working to expand the market for the colorful legume. Washington students taste-tested the company’s green garbanzos through a pilot program last spring in districts from Highline, south of Seattle, to Thorp and Cle Elum in Central Washington and locally at Mead and Spokane. The bright green beans are already served at Seattle University, Washington State University and Whitman College. They also have graced menus at Masselow’s at Northern Quest Resort and Casino, a couple of eateries at the Coeur d’Alene Resort, Spokane’s Steam Plant Grill and some of Tom Douglas’ restaurants in Seattle. A retail pack isn’t expected to hit select stores until autumn or early winter. Meantime, they’ll be featured in a charred Monterey Bay squid salad with chorizo on July 19 at The Alley at the Bite of Seattle. The vibrant green beans hail from the same plant, only they’re harvested earlier when the legume is in its live state and full of moisture. They’re also more nutritious, with double the fiber and nearly double the protein. The company formed in 2012, but dates to a fourth-generation Palouse farmer who had been working to create a market for green garbanzo beans for more than 20 years. Jonathan Sweatt likes that color pop – among green garbanzo beans’ other attributes. The co-owner of Spokane’s Downriver Grill, Flying Goat and Simply Gourmet, a catering company, Sweatt, 37, has been developing recipes spotlighting the little green globes. They’ve appeared on pizza specials at Flying Goat and in entrees like a red quinoa summer salad and Mediterranean pan-seared halibut with garbanzo bean puree at Downriver Grill. His brother, Aaron Sweatt, 36, is the Pacific Northwest sales manager for Fresh Nature Foods and one of the company’s three full-time employees. He’s working to build local distribution, but points out the product is already shipping to Canada and the United Kingdom as well as major cities throughout this country – from New York and Chicago to Los Angeles and Portland. Combine beans, roasted garlic, tahini, paprika, lemon juice, vegetable stock and onion powder and place in food processor. Puree beans slowly adding the olive oil until consistency is smooth. Garnish with fresh herbs and freshly squeezed lime juice, or pickled radish, and serve with warm grilled pita bread. Make the salsa by combining tomatoes, onion, cucumber, jalapeños, olives, garlic, capers, vinegar, lemon juice, red pepper flakes, basil and ½ cup of green garbanzo beans in a medium bowl. Set aside to let flavors marry. Cook and mash potatoes. Steep ¾ cup of garbanzo beans in the vegetarian stock. Puree mixture in a blender. Fold into mashed potatoes, and season to taste. Roast carrots in 350 degree oven until tender. Sear halibut in olive oil/canola oil blend and finish in the oven (you will know your fish is cooked perfectly when it is fork tender). Lay three carrots on each plate and top with a bed of the potato-garbanzo bean mixture. 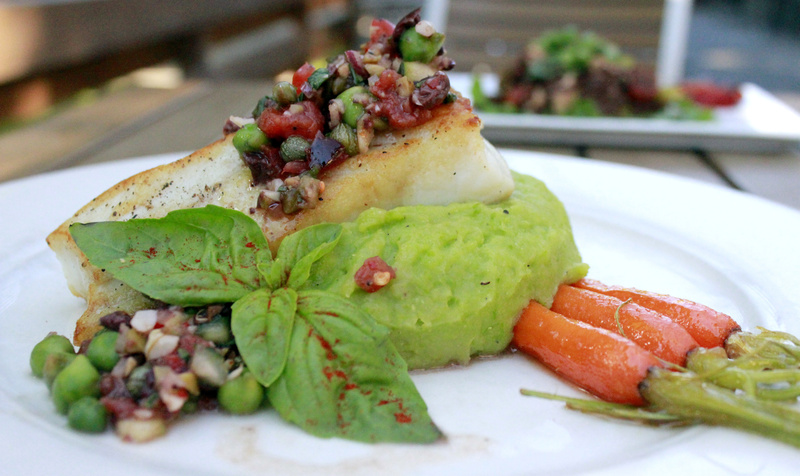 Place fish on top of puree, then garnish with the fresh salsa. Blend all ingredients except for the seeds in a blender. Sprinkle top with chia and flax seeds, and serve. For the salad: Boil quinoa in water. When tender, rinse and drain well. Cool on sheet pan. Microwave green garbanzo beans for 2 minutes, then let sit for 1 minute. Mix with quinoa, cucumber, pepper, celery, carrot, onion and parsley. For the dressing: Combine remaining ingredients and mix well. Mix dressing with quinoa mixture and serve. In a 4-quart saucepan over medium heat, add butter, onion and garlic. Cook until softened, about 10 minutes. Add garbanzo beans and 4 cups stock and simmer uncovered until the beans are tender, 8 to 10 minutes. Stir in basil, cream, and remaining cup of stock. Remove from heat. In a blender, purée soup in batches until smooth. Add salt to taste, and serve.